A couple months ago I posted a question on the Cole’s Classroom Facebook group asking what is the one area within newborn photography that people struggle with the most. Nearly all the responses were related to the photo editing process taking forever. Not a huge surprise… Many told me that hours would be spent fine tuning each and every newborn photo within Photoshop. The problem with spending so much time editing photos is, that extra time spent is drastically cutting into your profits and your hourly rate…and I want you to make as much money as possible. So I set out on a mission to help out the masses of newborn photographers who were struggling with how to edit newborn photos in Lightroom and not spend hours on end retouching each photo in Photoshop. The good news? I got a great solution and a video demo to prove it! After having numerous photographers send in sample newborn photos that I could use to test with the Essential Newborn Lightroom Presets were created. The Newborn Lightroom Presets are the perfect photo editing solution to compliment our online Newborn Photography Workshop which is why they are included 100% free within the workshop. A hypothetical question for you: What would you do with the extra time you’d have on your hands if you could edit an entire newborn session in less than 1 hour? For some of you, that might sound crazy and totally unattainable…but I think it is. In fact, I just did a single sample photo edit with full retouching in only 65 seconds! Keep reading, or even skip to the bottom to watch the video, and watch me as I show you how to edit newborn photos in Lightroom in 65 seconds or less! Look below to see the original photo and what steps I took to come up with my final complete photo edit it in Lightroom. Note, “Springtime Baby Brighter” from the Essential Newborn Lightroom Presets Collection was used in which the presets are designed to instantly clear up some skin blemishes and make your photo retouching easier. See this step in the video demo below. 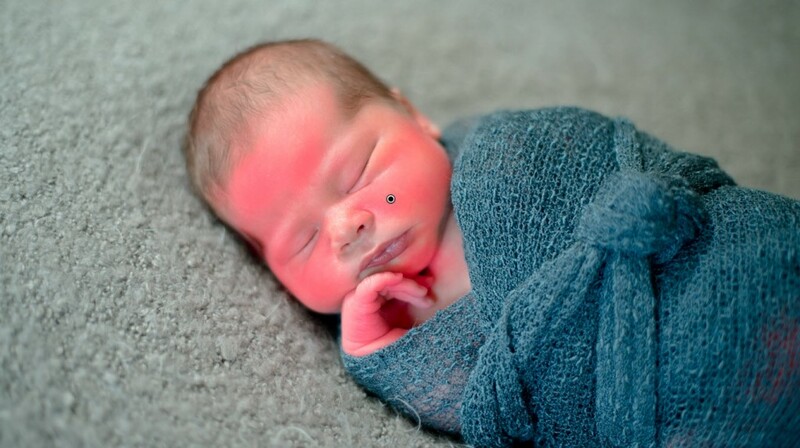 For this newborn photo edit, I used the Lightroom Spot Removal tool to replace the missing blanket in the upper right corner using the heal brush, then removed the circular skin blemishes on the face. Once done with the blanket and the skin blemishes, I used the Cole’s Skin Soften adjustment brush to smooth the skin to give a nice creamy newborn skin tone and also the Red Skin Removal adjustment brush to slightly remove some of the redness on the face. Once you’ve selected your adjustment brush for both softening the skin and also removing any redness – hit “O” on your keyboard to bring up the overlay showing you where you are adjusting to ensure you aren’t adjusting any areas that you shouldn’t be. …and here is my final image after 65 seconds of editing within Lightroom! To see the video version to see Retouching Newborn Photos in Lightroom in 65 Seconds! If you would like to simplify your life and speed up your newborn photo editing workflow by using my presets you can do so by seeing more details & purchasing them right here OR you can get them for 100% free within the online Newborn Photography Workshop! Click the banner below for more details with the workshop and to see how this 24/7 lifetime access premium training can help you and your business. As always, if you have any questions, I am just an email away…talk soon! 21 Responses to How to Edit Newborn Photos in Lightroom in only 65 Seconds! Do I already need to have the Lightbox program installed or is all I need to begin editing my newborn pictures your presets? Your skin soften and redness removal brushes are my go-to’s for almost every photo, newborn or not! I’m probably not down to 65 seconds, but your newborn collection has definitely been a game changer in my editing time. Thanks again Cole! I purchased these presets a month ago and really love them. However, I was just reading this tutorial and realized that I don’t have the red skin removal adjustment brush. Can you help me understand why or direct me to it? Glad you love the presets! You certainly do have them included, it is part of the “adjustment brush presets” 🙂 If you need any additional help please email me direct. Thanks! Thanks so much for your reply! I actually realized shortly after posting that comment that I just didn’t have it installed correctly. Oops. Got it up and working now 🙂 Thanks again! Hi Cole. please help….I do not have the effect “red skin removed retouch ” can you tell me as I can have? Hello – that brush is included in the “adjustment brushes” folder. Take a look at the zip file and look for that folder and you’ll see it. Follow the installation instructions as the directions to install are different than the others. Cole, I learn something new from you every.single.time I read or watch a tutorial. Thank you! Hey Cole, what camera and lens did you use to take this photo? Thanks! Cole, If I download your presets, do I need anything else? Or can I just use your presets? Do I need photo shop? This isn’t your photo this is oliver from the Daily Bumps on YouTube!! You should be ashamed for stealing their photo. I really liked your tutorial. Hope you decide to do one of children/teens. Does it work with LR3? Hi Cole! I just came accross your page. I am a college student pursuing a degree in photography. Do you currently have any student discounts available? Hi Jamie, we offer many products and tutorials free, and our some of the paid presets and workflows are offered and various price points to fit every budget. Good luck in your pursuit of photography! It’s a great ride! Why the New Nikon 35 1.8G FX Lens is a Game Changer!